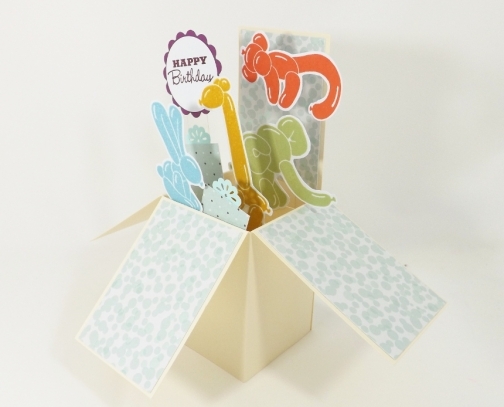 Give someone a bright and cheery balloon animals cluster in this pop up box card. I hand stamped and hand cut, the balloon animals. The "Happy Birthday" sentiment and the monkey have some wobble movement for added fun. This card comes with an envelope and folds flat for mailing! Your personal message to the recipient goes on the back. 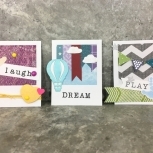 Write it out and then adhere the sentiment to the back of the card with glue or double-sided tape. 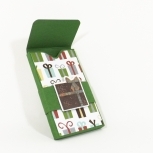 You will receive TWO sentiments strips, just in case you need a spare for a "do over"! This vertical hand made pop-up box card measures 4 by 5.5 inches (roughly 10.2 by 14 cm) and comes with a hand made, self-adhesive envelope which I decorated on the front with "Let's celebrate" and confetti images. A shop label, signature and creation date appears on under the front flap of this hand made greeting card.